"Air Superiority Origins Tourney" in Challenge magazine #32 summed up the results of an Air Superiority tournament series. As they stress in the rules, hardware matters, but tactics matter more. The tournament results were sometimes surprising, with well-handled obsolete fighters shooting down top of the line models less skillfully handled. "The enemy coastline looms suddenly out of the darkness. An F-111D descends to terrain-following flight. Flying at nearly Mach 1, the plane streaks over the countryside, too low to be detected by radar. The PAVE TACK infared optics pod searches for a target. Abruptly the sky is filled with tracers as antiaircraft guns fire blindly at the noise of the intruder. Target identified, the weapons officer illuminates it with a laser, releases the plane's laser-guided bombs and turns violently back for the coast. The target goes up in smoke and flame. Half of the mission is complete. What remains is getting home alive. • Air Strike expands the proven and successful Air Superiority system to encompass air strikes against targets on the ground. New rules cover: Terrain-following flight, air-to-ground attacks (including strafing and bombing), antiaircraft artillery, and surface-to-air missiles (SAMs). Air Strike continues Air Superiority's easy-to-learn format. Rules are presented in a programmed structure, followed by scenarios demonstrating their use. • Air Strike provides 32 new aircraft for the Air Superiority system, including: the Warthog (A-10s), F-1 5 Strike Eagle, Harrier II, Alpha Jet, SU-25, and MIG-27. Six new multi-color maps provide the varied and treacherous terrain over which players must find their targets. Included are 480 counters, representing everything from radar sites to the most modern air-defense missile and gun systems in service today. Trucks, tanks, infantry, and other targets are provided as well; but remember, on today's battlefield, what can be shot at can shoot back. 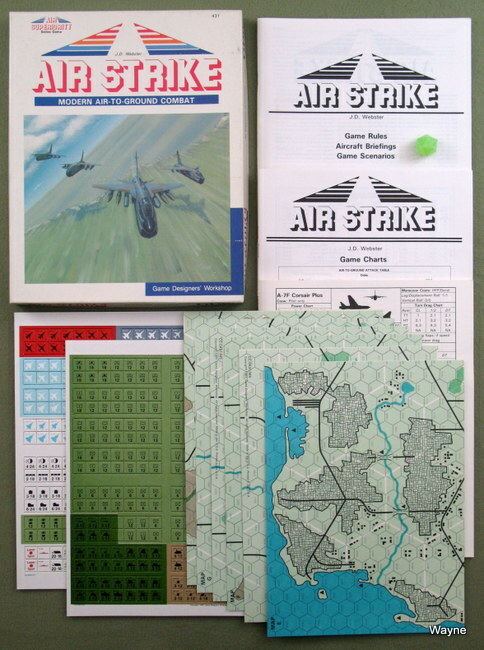 • Air Strike includes 25 scenarios suitable for solitaire, two-player, or multi-player play. Ranging from the Mideast to Germany, from Afghanistan to Africa, these scenarios provide players with a wide variety of complex and interesting situations. Several of these can be played both as solitaire and as multi-player simulations. 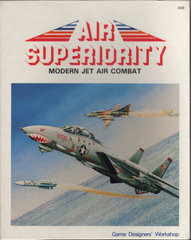 The briefing booklet helps bring players up to date on the weapons and aircraft included in this game. It is a helpful aid to learning the abilities and limitations of the aircraft and weapons depicted in Air Strike." "For over three decades, the turbulent Middle East has been the proving ground for modern air combat tactics. Nearly every major type of combat jet built by the East and West blocs has been blooded there. In the numerous conflicts of the region, air forces trained in British, French, and American doctrine have fought against those trained in Soviet methods and against each other. The Middle East wars have seen Arab fighting Israeli, Arab fighting Arab, and Arab fighting Persian, with tactical air power the key weapon. The numerous Arab-Israeli wars forged the world's most successful combat-experienced jet air force, the Chel Ha'Avir (Israeli Air Corps). It is mainly through the historical battles of this air force and its key opponents (as featured in this module), that important periods in the evolution of air combat are illustrated. This is an historical module, tracing jet combat in the Middle East from the 1950s to the present. As such, scenarios include actions not only from the Arab-Israeli wars, but also from several other regional conflicts. Desert Falcons introduces optional rules for pilot/crew quality, experience, campaigning, and ejection survival. Additional rules are thrown in for those desiring increased detail in their Air Superiority games." Based on the award-winning system used in the original Ace of Aces. Wingleader™ is the exciting, fast-paced game of World War II air combat based on the award-winning picturebook game system first used in Ace of Aces®. Wingleader puts you in the cockpit and lets you make the decisions. Every page of the two Combat Books is photographically illustrated with two of the most famous fighters of the war: the North American P-51D Mustang, and the Focke-Wulf FW190-A. Each photo show what you see looking from the cockpit of your plane. Is your opponent in your gunsights? — or in your rearview mirror? One brilliant tactic — or one wrong move — can instantly mean the difference between victory and disaster!" 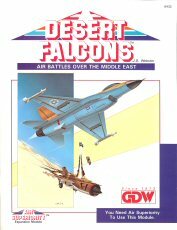 An aircraft combat game by Nova Game Designs, better known for their "Lost Worlds" gamebooks. 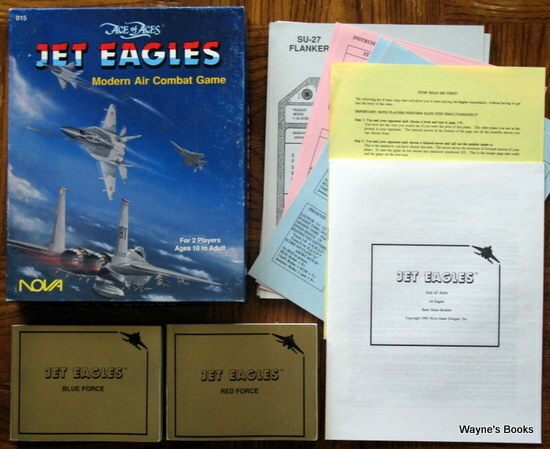 "Jet Eagles is the exciting, fast-paced game of modern air combat based on the award-winning picturebook game system originally used in Ace of Aces. Jet Eagles puts you in the cockpit of one of the most sophisticated deadly; high-tech fighting machines ever built — and lets you make the decisions! Every page of the two Combat Books is photographically illustrated with two of the most advanced fighters ever to fly: the U.S. F-15 Eagle and Soviet MiG-29. Each photo shows what you see looking from the cockpit of your plane. Is your opponent locked-on in your Head-Up Display, with missiles or guns armed and ready? — or is he on your "six?" One brilliant tactic — or one wrong move — can instantly mean the difference between victory and disaster! 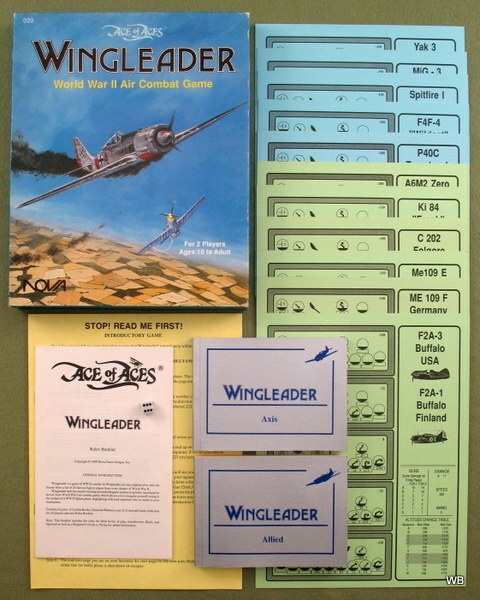 Contents of game: "Read Me First" Rules, Rules Booklet, 2 Combat Books, 2 Joystick Markers, 12 Aircraft Cards (with stats for 24 different jets), 2 Missile Cards, and 2 Instrument Panel Cards, and a rules booklet which includes the rules for three levels of play: Introductory, Basic, and Optional."